Clearing your home of unwanted junk can be bit of a challenge at times, especially if it has been quite a while since your last house clearance and rubbish has mounted up in the meantime. When it comes to effective and affordable house clearance London based customers can rely on us to provide them with the most efficient and cost effective rubbish and junk clearance service available right now. 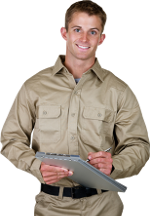 We will make this tedious and time consuming process quick, easy and hassle-free. Our house clearance service in London is quite flexible and suitable for single item, partial or complete property clearances. We will be able to clear away all sorts of different items and junk cluttering your home, including old furniture pieces, redundant house features and accessories, disused or unrepairable appliances and electrical goods, unwanted clothing, pieces of damaged or unused kitchen equipment, including cabinetry and many more. In many instances, discarded items and pieces of junk you need to get rid of, are stuck under heaps of other rubbish, or they are placed in awkward spots around your property, which makes disposal on your own a real problem. We will deal with the situation effectively though, as we will dig out and collect junk and rubbish from anywhere on the property, quickly and safely, without risk of damage or injury. Our London house clearance service is absolutely hassle-free for our customers, because we will do the heavy lifting and loading of items for you. 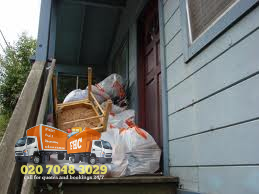 We will perform your London house clearance with the least amount of mess and inconvenience, if necessary we can also sweep up after loading the rubbish, so you have one less thing to worry about. During house clearance, London customers might realize there are certain items which may be reused or given to charity, if such items of value are present, we’ll single those out and put them aside. If necessary we will also advise you on what to do with them, or which charity organisation to contact for their collection and redistribution. As expected, we will review the junk and rubbish you need to get rid of, and recycle and reuse as much of it as possible, in order to divert at least some of the stuff from ending up in landfills. Adequate disposal of all other items is guaranteed. Our London house clearance service is available for booking seven days a week. 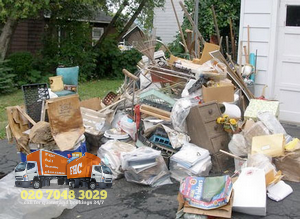 The flexible and convenient waste and junk removal service by Full House Clearance Ltd is also quite suitable for disposing of excess amounts of general household rubbish after large scale spring clean-ups, or after big events and home gatherings. Generally, we can collect and dispose of most types of household junk and rubbish, but customers need to be advised that certain types of waste will not be part of the service, such are dangerous or aggressive chemicals, including asbestos, volatile substances and explosives, as well as bio hazardous waste. The waste and junk house clearance services in London are available for booking by customers seven days a week, with flexible and convenient service hours which work around your daily schedule. For large scale waste clearance services in London, we might suggest a preliminary job viewing in order to organise and carry out your clearance request in the most time and cost effective manner. 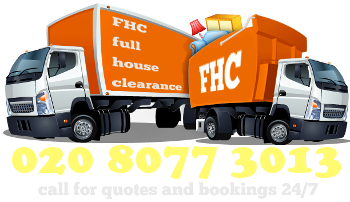 Call us ( Full House Clearance ) today for a free quote and we would be happy to assist you.